Buckle up, because it's gonna be a bumpy ride. Whether we’re cramming for a test or looking for a late night snack, Jimmy John’s has always been there for us college students. We all too often find ourselves calling in our orders at all hours of the day, fiending for one of their sandwiches. However, waiting for our precious meal isn’t as happy as you’d think. From excitement to panic, Jimmy John’s raises your emotions to an all-time high. Here’s what you can expect next time you order a Hunter’s Club from the big JJ. You pull up the JJ’s website on your computer and scroll through all of the options. Should you get the Vito’s or the Ultimate Porker? Jalapeño or salt & vinegar chips? Can you afford a drink? The possibilities and combinations are endless. It seems like whenever you order there is always some sort of issue. They can’t hear you. The card doesn’t work. You can’t find the option for extra onions. The JJ’s app won’t connect to wifi. Or even worse, you call the store that doesn’t deliver to your neighborhood and you have to start all over again. 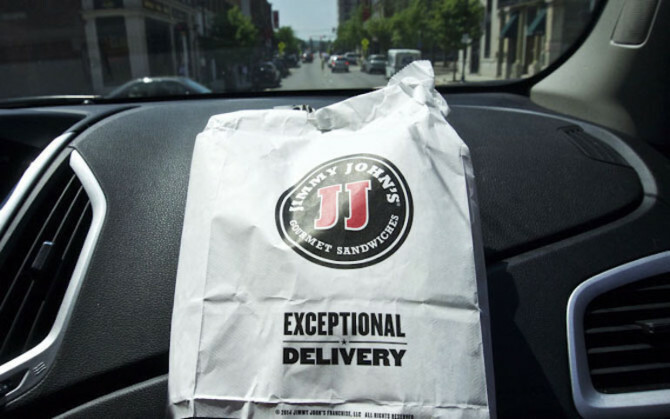 For freaky fast delivery, JJ’s sure knows how to get your heart racing. You crane your neck listening for the doorbell and shush your friends. You ask, “Was that the doorbell?” countless times, much to the rolling of eyes or envy of your friends. You start to sweat. Could the delivery person have gotten lost? You’ve given up hope. You feel the sympathetic smiles of your friends but even they can’t understand the deep sadness you feel inside. You convince yourself that your sandwich isn’t coming. A tear rolls down your face and you hasten to wipe it away before anyone can see. You look in your empty fridge for something to tide you over. You even consider (gasp) ordering from a different vendor. Finally, your sandwich arrives. You hear the doorbell ring and run as fast as you can, for fear of the delivery person turning around. You swing open the door, and there it is. Your sandwich. You almost shed tears of joy as you hastily sign the receipt and shut the door. And then with that first bite, you realize that the roller coaster of emotions was all worth it. As you work your way through the sandwich, you think about what a dark place you’d be in without JJ’s on your speed dial. JJ’s makes you a better person. Those sandwiches, always there for you through thick and thin. You thank your lucky stars for sending you the delivery man who understands you.